The construction industry runs of scheduling. Construction project from mega builds down to small residential construction have to be finished and delivered within a specific time period otherwise it can cause costly delays, disputes, arbitration or even lawsuits. If you need more convincing about the importance of scheduling in construction, you just have to look back to the infamous Boston’s “ Big Dig” downtown expressway project. When the mega construction project was finally completed in 2006, it was eight years behind schedule and was 19 Billion US dollars over budget taking into consideration debt service and inflation. That’s a lot of money and time wasted that could have been prevented if you had used a construction scheduling software. 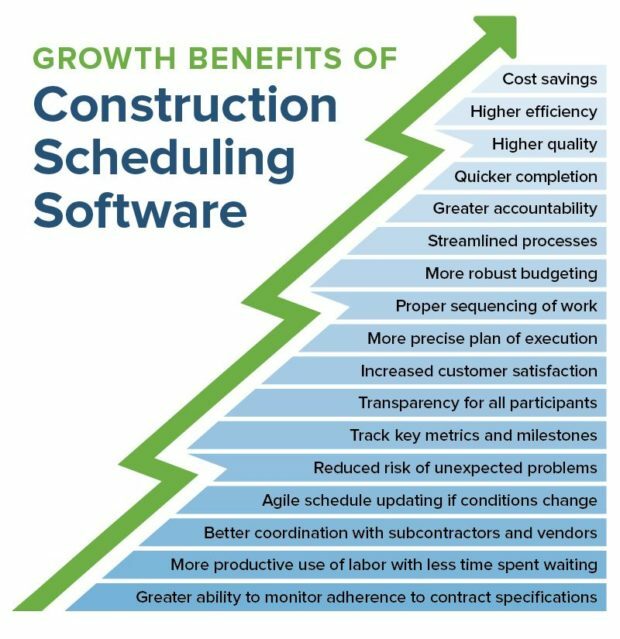 So, how do you determine if your company needs a construction project scheduling software? Well, if you are building anything over the most rudimentary building project, your company would surely benefit from using a construction management and scheduling software. A construction project management scheduling software is a collective term to a variety of programs made by software giants to small niche players that construction professionals use to assign, organize and forecast work on construction projects This kind of program is not new and have been around since the 60’s when researchers made use of algorithms and applications to streamline and improve the scheduling process. Construction scheduling can play a key role in keeping work on a track, and using a construction scheduling software can help in improving efficiency, information sharing, transparency and quality control among many things. However, since there are so many out there in the market, finding the right that can fit your needs might prove to be a difficult task since a small custom builder can have a very different budget and system requirements compared to a contractor that’s managing a mega project. Today, construction scheduling comes in all forms, – from free tools to paid sophisticated highly detailed, multi-user systems. One of the best ways of finding out which is the best construction scheduling software for your company is to determine that right balance between intricacy and cost. Choose a software that’s affordable ( or free) but at the same time, sophisticated enough use. Sometimes, it’s worth to pay a big price for a software, and at times, the free options are just as good. To help you decide if you want to go the paid or free route, it identify yourself within four buyer profiles as written by Eileen O Loughlin for softwareadvice.com when you are looking for a construction software so that you can decide if you want to go with the more expensive paid options that are out in the market or stick to the free options. Construction Project managers are involved with many complex planning and management activities, and scheduling is only one of the tasks that they deal with. If you belong to this buyer then you are more than likely want to purchase c construction management that includes a scheduler as one of its modules. For these people, scheduling is their life, as well as their full-time job. Their job includes construction planning and updating schedules in extensive detail. These people usually use sophisticated project management and performance measurement techniques in scheduling. If you belong to this group, then you can benefit from a software that automates everyday repeatable scheduling tasks. Generally, you would pick the best stand-alone scheduling software available in the market. Desktop schedulers are people who work on thorough schedules but don’t have the need for multi-user functionality. If you belong to this group, then, you can usually work with a program that offers a simpler scheduling option compared to the needs of project scheduling specialists and project managers. Calendar Managers people don’t do scheduling for complex construction projects, and usually make a plan for smaller less complicated projects. If you think that you are part of this group then, your needs can be easily met with a free scheduling management software, or in some cases, a simple calendar app will suffice. With this said, below are a small list of paid and free scheduling software for construction that can kickstart you in your quest to find the best software that will fit your needs. Paid construction software for construction scheduling is a good option for your company if your company struggles with scheduling, run a lot of projects requiring scheduling, or if the need for scheduling is a constant need in your company’s operation. Procore is a web-based SaaS model construction project management software with a scheduling feature. With its powerful scheduling software, your team is able to view the latest up to date schedule which happens in real time. With this, users never have to worry that they are looking at an outdated schedule. Procore enables your team to have customizable views and filtering. This is very useful because not everybody on the team is familiar with Gantt charts, the Procore schedule tool also offers a calendar view, by day or month. Procore’s project tasks for the construction schedule are presented as individual bars which display the task name, what resource is assigned to that task, as well as the start and finish date. Each job has a live, clickable link that allows the scheduler to edit several items for each job. Microsoft Project is a project management project that is developed and sold by Microsoft and is designed to assist project managers in developing plans, assigning resources to tasks, tracking progress, managing budgets as well as analyzing workloads. This software creates a critical path schedule, and a critical chain third-party add-ons are available from Pro Chain and Spherical Angle. Schedules can be resource leveled, and the chain can be visualized via a Gantt chart. Resources in the form of people, equipment and materials can be shared between projects using a shared resource pool. Each resource has its own calendar which shows what days a resource is available, and automatically shifts an available resource. Many project managers like Microsoft Project because its dashboard is very easy to learn to grant that you’ve used Windows and other Microsoft products. It cost $589 for the Standard Version and $1160 for the Professional version. The cloud edition – Microsoft Project Pro for Office 365 cost $25 per user/month. FastTrack Schedule 10 is a project management software that’s available to run for both PC and MAC Platforms. This program creates schedules from MS Project, Excel, Mindjet, MindManager, and other databases. The program allows you to see where there might be scheduling conflicts and contains templates that allow you to quickly schedule your projects. It allows you to display your projects and view their details in Gantt charts, monthly calendars, and resource graphs as well as track their performance highlighting the critical path. This program allows share project details with your team members through printing, exporting and emailing project schedules. Fast Track costs $349 for a single user license, $448 for a single user license with training. For a 5 user license, it cost $ 2995, and $3169 for the business edition. However, if you already have FastTrack 9 installed in your system, you have the option to buy an upgrade for $179. For all the options, you can also purchase the training module for an extra $100. Everybody loves free, but just because this software are free doesn’t mean that they can’t hold a candle up to their paid counterparts. This software can work well for people like desktop schedulers and calendar managers who don’t do complex schedules for construction. Agantty is a FREE project planning software, which means that all native functionality is free to use from the start. These functionalities include unlimited tasks, projects, and users as well as the ability to set team and user permission. Agantty has the shared Gantt chart view wherein users can create and sort tasks as well as an individual dashboard where they can see tasks and projects that are assigned to them. One setback to this software is that there are no options to invite external clients or users to collaborate. Every user whether they are internal or external need to have an account with the vendor. Overall, Agantty is an ideal solution for small and midsize businesses that want to be a step above schedule management but don’t need a robust project solution that offers reporting or resource management capabilities. Airtable is a new player in the project management market compared to its counterparts in this article. The free version allows you to create unlimited projects which it calls bases, and track up to 1200 tasks or records per project. Users are able to add files up to 2GB in size per base, and also have the ability to comment on tasks. Airtable is designed like a spreadsheet and allows you to build databases containing information like project details, client accounts, and team budgets. Airtable is easily customizable, and allows the users to view the tasks as lists in a spreadsheet, cards on Kanban board or even as of date fields in a calendar. One of the drawbacks of airtable is that it’s not easy to learn and novice users might find it overwhelming because of the many different functionalities. There are also functionality limitations on its mobile version. Although the software is free, there is an option to upgrade it for $12 per user per month. Asana offers functionalities like project planning, file sharing, task management, and team collaboration. Although there is a paid version, the free version allows the user to create unlimited tasks and projects, but only up to a maximum of 15 team members. Other options like creating task dependencies or private projects are not included in the free version. Asana allows users to build project roadmaps, understand task dependencies and coordinate with team members out in the field. In addition to all of these, it can integrate with third-party tracking, communication and reporting tools. The downside is that, like Airtable, it’s not a software that novice users would find easy to use. The software is text heavy, and the dashboard is not an easy to use and interactive interface. Should you wish to upgrade the software, you can do so for $11.99 per user, per month.